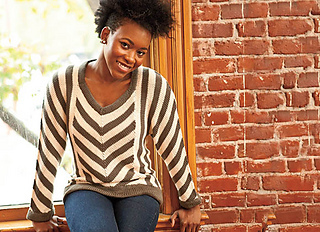 This fun and interesting to knit pullover design features a multi-directional stripe pattern. 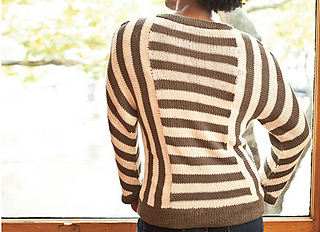 V-shaped stripes in the front are framed by vertical stripes on the sides, for a visually slimming effect. The shaping of the front panel creates a stretchy bias fabric, which drapes over any figure in a flattering way. Seams are avoided by working picked-up stitches to connect the various sections and using the 3-needle bind-off technique. 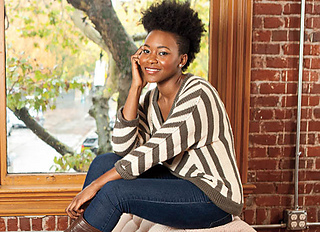 The cropped sleeves are worked from the top down for easy length adjustment. A central decrease runs from the shoulder to the wrist, creating an extremely stretchy bias fabric that is fitted to the arm from elbow to wrist, making this updated dolman style very easy to wear. 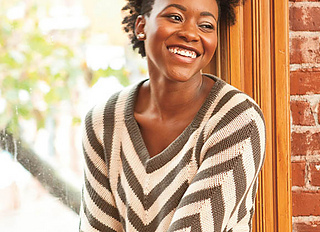 Stockinette turned hems give a soft finish and create essential structure to this soft drapey garment. • 32 (36, 40, 44, 48, 52, 56)” Finished bust measurements; garment is meant to be worn with 2” of ease. The sample shown is a 36” bust. The sk2p is mis-typed in the Key. Should read: S2KP- Double decrease: slip 2 stitches together as if to knit two together, knit the next stitch, pass the two slipped stitches over the tip of your needle.